A unique and spectacular furnished home in Yorkville. Live in the most luxurious and convenient area of downtown, walking distance to all the best amenities. Three floors of renovated modern living space in the city's best neighbourhood. Enjoy this urban oasis for the summer. A sleek loft-inspired 1 + Den condo on King Street West, tremendous space at 870 Sq Ft, with sleek concrete floors, floor to ceiling full length windows that provide a stunning view of downtown. A 10 minute walk to the financial district. The Adelaide Furnished Executive Suite is a stunning new corporate 1 Bedroom + Den furnished rental apartment for the busy professional. Located near Queen St and the Financial Core, this furnished condo offers lots of attractions and nearby locations to enjoy. An exceptional large 2 Bedroom + Den, 2 Bathroom 1,200 Sq Ft condo; located at the most coveted address on the 'Mink Mile' in Yorkville. It is a spectacular open-concept furnished apartment with a newly renovated interior, in the heart of downtown Toronto. A gorgeous 1 Bedroom + Den newly furnished apartment. This luxury furnished condo is in the heart of Yorkville, giving you the convenience of walking to all your favourite destinations. Live in the best area of downtown Toronto. A modern and elegant Toronto furnished rental apartment located in Yorkville and outfitted with luxury design furniture. This stunning private 1 Bedroom condo features hardwood floors and a balcony overlooking a stunning courtyard. A stylish furnished apartment in Yorkville, with premium furniture. A large 1 Bedroom + Den furnished rental, 650 square feet, hardwood floors, walk-out balcony and designer furniture. Stay in Yorkville and enjoy the city's best locations. A Cool and modern luxury condo in the midst of the best downtown neighborhood - fully outfitted with premium furnishings and features a walk-out balcony, beautiful hardwood floors, en-suite washer/dryer and it is 2 minutes away from the subway. Enjoy the condo and the excellent building amenities. A Premium 1 Bedroom Toronto short term rental, with all new furniture. This Toronto furnished apartment is located near Yonge and Bloor, next to the new Four Seasons Hotel. Live in the best part of downtown Toronto, with the subway at your doorstep. This breathtaking Toronto short term rental is a large 1 Bedroom + Den luxury apartment in one of the newest developments on trendy King Street West. The stunning furnished condo is 700 square ft with 2 balconies, providing plenty of natural light all day. This Yorkville luxury apartment is a classic and elegant furnished condo with 1 Bedroom + large Den in central Yorkville. A classic modern interior and located near the Yonge and Bloor intersection, it is walk-friendly and just two blocks from the subway. A luxury Yorkville Toronto furnished apartment with all the amenities to provide you with a super-comfortable and convenient stay. This suite is a 1 Bedroom, 650 square foot space, with hardwood floors, walk-out balcony and design furniture. 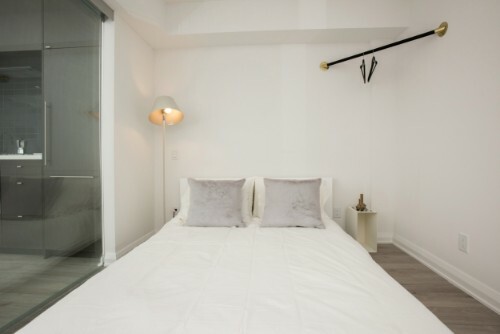 A stunning 1 Bedroom Toronto furnished rental apartment, in the best part of Yorkville. A peaceful, modern and calm furnished rental, near Bay and Yorkville Avenue. Enjoy all the nearby luxury amenities, including Equinox Gym, Whole Foods Market and Nespresso Cafe. Open-concept 1 Bedroom, 1 Bath condo, the Stunning Yorkville Furnished apartment is a large and bright furnished apartment, with a serene open layout, floor-to-ceiling windows. Enjoy the city’s best shops, museums and restaurants, all within a 10-minute walk. This spectacular 1 Bedroom furnished rental condo at College Street is a well-lit, furnished luxury condo in the heart of downtown Toronto. Walking distance to Queens Park and all downtown hospitals, Yorkville and College Street. Enjoy the large suite and stunning view. A contemporary furnished executive suite, this 1 Bedroom studio furnished condo is open-concept and very conveniently located, in the iconic Former Four Season Hotel, steps from Whole Foods, Equinox Gym and the new Yorkville Village Shopping Centre. The Yorkville Luxury Condo, a comfortable and stylish living space, is located in the most convenient, prestigious part of Yorkville, near the Yonge and Bloor subway. A spacious 1 Bedroom condo with hardwood floors and full balcony. Stylish and elegant, this luxury furnished apartment is on a high floor, providing a stunning view of Toronto. An open-concept 1 bedroom condo, with a full-length balcony. In central Yorkville and walking-distance to all the best amenities. A spectacular and enormous 3,000 square foot, 2 bedroom, 2 bathroom suite on the west side of the city and along the beautiful coast line of Lake Ontario. Features all luxury fixtures, beautifully designed.